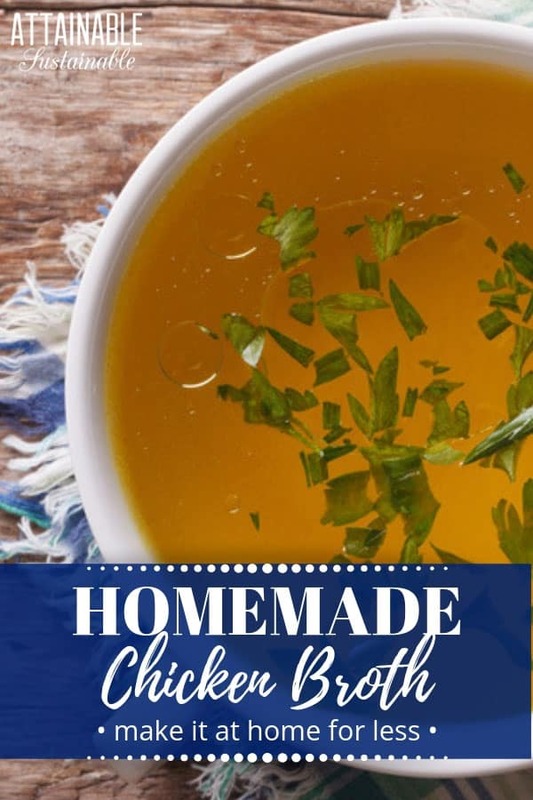 This homemade chicken broth is easy to make and is great for drinking or as a base for soups. Instead of spending money on canned broth, save some money and make your own. It’s easy! My mother would no sooner toss out a roasted chicken carcass than she would rob a bank. Consequently, neither would I. But I’m shocked at the number of roast chicken carcasses I’ve seen go in the trash over the years (mind you, I’ve rescued some, too). Is it because the cooks don’t know how to make chicken stock? Or because they think it is too much work? People, listen. Even if it’s a store bought roasted chicken that came home with you in one of those end-of-the-day-what-will-I-feed-my-family moments of panic, you can use it to make homemade chicken broth. And I promise it’s easy. Making chicken stock at home also eliminates the cans or boxes that store-bought stock comes in, along with questionable ingredients. Not to mention the environmental issues that come with purchasing a product that may have been shipped halfway around the world. You can make chicken broth with just a chicken carcass or chicken bones, but you’ll add flavor if you add some veggies to the pot. These can be leftover veggies, they can be wilted veggies salvaged from your produce drawer, or — get this — they can be trimmed ends! That’s right, the ends of carrots, celery, and onions that you cut off when you’re cooking? Toss them into a container [like this] as you trim and stockpile them in the freezer. When you’re ready to make a batch of homemade chicken stock, add those for extra flavor. You can make homemade chicken broth on the stovetop in a large stockpot. Bring the liquid to a simmer, then turn the heat down to low. Keep the lid on the pot and cook for 24-48 hours. Or you can set it to low in your slow cooker, again cooking for 24-48 hours. Personally, I prefer the slow cooker method, since I’m a bit nervous about leaving the stove top on overnight. Adding a few tablespoons of vinegar to the water will help draw all the nutritional goodness out of the bones. Processing a homemade roasted chicken at home allows you to create a low-sodium chicken broth with lots of flavor to use as a soup base. Place the chicken carcasses in a stock pot along with the vegetables. Fill the pot with water to within 3" of the top. Bring to a low boil, then simmer (with the lid on, of course). How long, you ask? My mom always simmered for 2-3 hours to get a nice chicken stock, but more and more, I've been letting mine go for a lot longer. I don't like to do this on the stovetop, though, so I make it in my slow cooker. If you have a slow cooker, you have the freedom to let your stock cook for a day or two without having to worry about leaving a burner on for that long. Cooking for this long draws out all the goodness of those bones and makes a nice, gelatinous broth. To make it this way, simply toss your ingredients in, cover with water, and let it cook on low heat for 24 to 48 hours to create a rich bone broth. Use tongs or a slotted spoon to remove the chicken bones and vegetables. If you want pristine broth, you can strain it, but I rarely do. Ladle up a cup and enjoy! Divide excess into the freezer container of your choice (mind the headspace if you're using glass) and freeze for later use. 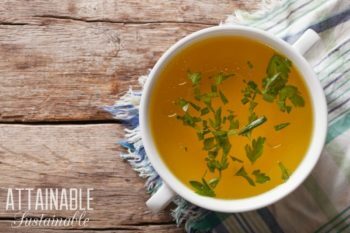 I use this homemade broth when I make polenta, risotto, and soups or simply for drinking. You could follow a specific recipe, but you know how I feel about measuring. My method probably wouldn't be approved by Julia Child, but it works and it's easy. *This is where you clean out your refrigerator crisper. Pull out the limp veggies you haven't used all week; celery, carrots, onion, garlic, greens - they're all fair game. I often make straight veggie stock, using essentially this method. It adds such depth to dishes. Love this post. I’m definitely going to try it. Also, I’d love to get your recipe for risotto. So far, I haven’t had much luck making a yummy risotto for my family. Okay. Duly noted. I’ll see if I can get a risotto recipe up for you! I REALLY want to encourage people to try this. I just started making homemade chicken broth this year, and I am amazed at how easy it is. Plus, it is practically free, which is a huge savings over the grocery store. BTW, I only started doing it this year, because, believe it or not, I never thought about making it from scratch, because I honestly thought it was from scratch out of the can! Isn’t it funny (well, funny and kind of sad) that even when we think we’re cooking from scratch, some of our ingredients are those of convenience? We’ve been so used to using these items for so long, they seem like they’re the “original” product. Happy to hear you’re doing it! I’ve been making my own broth for a couple of years. I actually can most of mine. It is the easiest pressure canning project and great for beginners. I actually wrote posts about chicken, beef and vegetable broth on my blog and how to can it. What I don’t can I freeze. My favorite part is it makes my house smell like Christmas dinner. I freeze both turkey carcasses from thanksgiving and Christmas and do one huge batch in january. I also will stockpile chicken carcasses in the freezer until I have enough to do a batch big enough to can. Make sure the broth doesn’t boil while you are cooking the bones and your broth will stay clear. Thanks for pointing out that this could be canned with a pressure canner, as well. also, if ppl haven’t done this before you don’t have to skin the onions or whatever. You’re going to strain all of that out. Just roughly chop and throw in there for flavour. Yes, I should have pointed out that not only do the onions not need to be peeled, vegetable trimmings can be used. Toss the ends of veggies like carrots, celery, parsnips in a freezer container and then toss them in when it’s time to make stock. Another note, you can save chicken carcasses and veggie peelings in the freezer until you have enough to make stock and/or the inclination to do so. It doesn’t have to be a perfect storm of ingredients. Shove it all in the freezer, it’ll keep. I make this and was with you all the way until you mentioned freezing. I never think to freeze it! What a good idea. But, remember not to freeze it in plastic. A lot of times I’ll just turn around and make a delicious chicken soup, but I have a LOT of recipes that call for chicken broth, so I’ve been trying to keep my freezer stocked with homemade broth. I will freeze it as “soup cubes” in an ice cube tray, and then transfer to a freezer bag. The soup cubes are typically 1oz per cube. You can use them as flavor boosters for things like rice or quinoa, or as a way to cool down soup for kids without diluting the flavor! I make mine the same way, but I cook it for about 12 hrs. This way the bones and cartilage break down and go into the broth. Super healthy!! I do this all the time. I also, save all my veggie “scraps” when I am cooking. Put them in the freezer and when I have a good pile I make broth. I use every bit of the veggies I cook with. It’s great and I always have broth on hand. Sorry for the silly question, but can you do this with other bones too, like beef or pork or lamb? Thanks. Yes, you can. Roast the bones first for the best flavor. Nice post. I’d just like to add these two bits. Chicken feet make all the difference in chicken soup and chicken stock. Carcasses are great, but the depth of flavor and the increase in collagen makes the feet a really great addition if you can get them. Also, just a bit of acid (like lemon juice or apple cider vinegar) helps to leach collagen out of the bones. Just a Tablespoon will work! This I am going to do now. But, I have another question. Can I freeze the juice from baking the turkey for later? I don’t think it would be good to can because the fat in it would get rancid. I don’t can my broth; I freeze it. Has anyone heard of roasting bones on sheet , low temp x2 hrs, then simmering with veggies and water?? My Mom did this w/ various red meat & pork bones. She’d collect bones, freeze them, roast when she had a goodly amount. Yes. Bones *absolutely make a better broth when roasted. I’ve done this. Where do you find the carcasses? They’re left over from cooking a whole chicken/turkey. So easy to make and a great result.